Last week The Hollywood Film Festival took place at the ArcLight Cinemas in Hollywood and honored star Penny Marshall with the Cinema Icon Award. The first evening of the film festival started with a dazzling red carpet outside of the theater. Some of the big names in Hollywood that were in attendance were David Arquette, Bai Ling, and Sam McMurray. While Arquette was able to slip by the red carpet, Bai Ling and Sam McMurray both discussed their experiences working on their perspective films, and how both give a positive message to society. 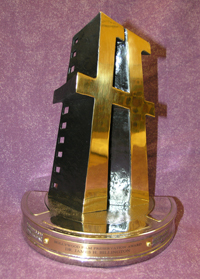 The coveted Hollywood Film Festival award. We were able to speak with both McMurray and Scott Ehrlich, the director of of the musical comedy Pearly Gates, about the film and their experiences on it. While McMurray does have a musical background, this is actually the first film in which he actually sings, and he absolutely loved it. Both McMurray and Ehrlich feel as though the film sends a positive message about being remembered, and how memories live on even after death. Bai Ling of course had jaws dropping when she hit the red carpet in a barley there getup, in which she was just wearing a peace of red fabric that covered her chest, and a sign around her waist with a Hollywood street sign that had key in the middle. The outfit was created by Ling, and was dedicated to the film The Key, which she stars in with David Arquette. The Key is based on the novel “Kagi,” and is about a married couple who have lost their ability to communicate honestly. “It is a film about a marriage, and trying to figure out where you really draw the line. What is right and what is not. And how two very different people experiencing the same things externally, have different views internally,” Ling stated.